When school communities start talking, good things happen. Connect with your school community to stay informed and share crucial emergency information in real-time. Minimize the impact on students, staff and site activities; Resolve incidents quickly. Simply point your web-enabled device to send out an emergency alert to your school community instantly. Message Sender emergency alert system allows you to deliver mass-alerts instantly to the entire campus via SMS, Voice-calls and Emails instantly with a click of a button. Cleary Act and Higher Education Act mandate a system to be deployed to alert campus community in the event of an emergency or dangerous situation. Failure to comply may result in a fine of $27,500 for each incident. Completely in the Cloud we use leading SAS 70 TYPE ll servers and guarantee 100% uptime. The efficient technology allows you to send thousands of messages within minutes. Web enabled with no-downtime and back up redundancies to deal with. It’s more software. Less IT. All licensing, usage, support, hardware and software costs included. Emergencies can happen anytime, Message Sender gives you the ability to deploy an emergency alert anywhere from any internet enabled device - PCs, MACs, smartphones, tablets and ipads. 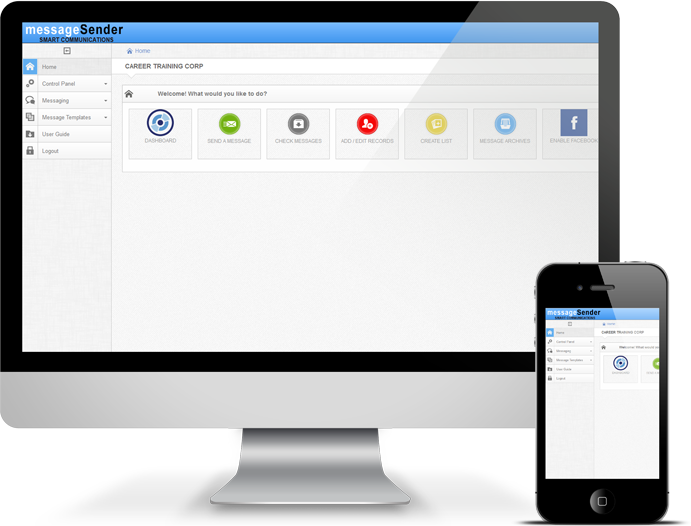 Message Sender's pricing is simply based on your enrollment. There is no complicated licensing agreement or contract. There is no special hardware or software required either. Unlimited and unrestricted usage is included in the base price. There is no additional user or messaging fees. So go ahead and get creative with communicating more effectively with prospective and enrolled students on a daily basis. Create email marketing templates/ notify prospective students. Use Message Sender’s Class Start notification feature to remind students of upcoming first session to increase enrollment and revenue, and reduce administrative cost. Schools and universities today are looking for the fastest, most effective means of communication to inform their campus community of any unanticipated emergencies and or crisis situations. Our vision is to empower educational institutions with tools necessary to put in place an effective notification service, yielding in improvement in both campus safety and student communication. We offer a seamless and scalable solution enabling schools to operate with agility and exceed community expectations.